Amidst record-breaking temperatures and devastating hurricanes, Spineless is well-timed. The impacts of climate change, ocean acidification, overfishing, and coastal development on our marine ecosystems have become increasingly difficult to ignore. In her debut book, Juli Berwald chooses the jellyfish to illuminate the looming threats to our oceans, offering these humble animals as aquatic canaries in the coal mine for today’s marine environment. Berwald first became fascinated with jellyfish while collaborating with a National Geographic photographer, who happened to be working on a separate piece concerning ocean acidification. Berwald noticed a chart in the story layout suggesting that jellyfish will be among the ‘winning’ oceanic creatures because they are impervious to increasingly acidic water, which dissolves the shells of other marine animals. This is a major reason, she writes, why jellyfish have been scientifically overlooked and understudied: early efforts to collect marine creatures with nets and bleach destroyed their delicate bodies and thus impaired any advancement in jellyfish research. Because their tissues don’t mineralize, jellyfish have also left few marks on our fossil record. The result is that jellyfish represent some of our oldest and hardiest species — Berwald notes that comb jellies and jellyfish were among the few survivors of a mass extinction 555 million years ago — but fundamental questions about their behavior remain unanswered. And today, although jellyfish do not have the kind of “charisma” (as one jellyfish scientist puts it) of polar bears, whales, and other species that attract grant money, Spineless is very effective in detailing the research that does exist and investing the reader in their fate. Which, Berwald argues, is intimately linked to the fate of our oceans and the wellbeing of our own species. As it turns out, the science of jellyfish — including what triggers them to sting, their uses of bioluminescence, and how they swim — is riveting. In a chapter on jellyfish stings, Berwald describes the development of a ‘sting block’—the equivalent of sunblock for jellyfish stings—that requires four different mechanisms: silicone to prevent tentacles from contacting human skin, chemicals that block jellyfish sensors from ‘smelling’ prey, sugars that mimic the scent of another jellyfish, and calcium to change the concentration of water near a stinging cell and prevent it from firing. Pretty complex for a ‘simple’ organism. In a chapter on bioluminescence, Berwald gives examples of the ingenious methods jellyfish and other marine creatures use to defend themselves. These include a deep-sea jellyfish that sheds glowing tentacles so it can escape in darkness, multiple species of fish that illuminate their undersides to mimic the light from the ocean’s surface, and sea cucumbers that use bioluminescent mucus to tag attackers, turning the predator into the prey. Berwald also argues against the notion that jellyfish are just passive floaters on ocean currents. Their efficient swimming technique — the key to which is the automatic relaxing of their bell-like bodies at the end of a stroke — propels them 80% farther without expending more effort. But the word “spineless” has a double meaning. 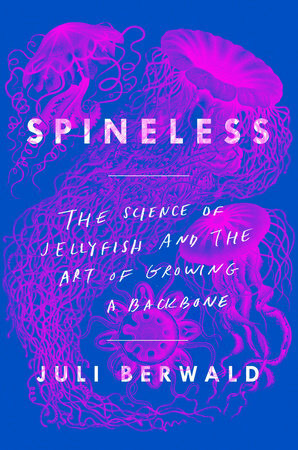 It refers not only to jellyfish anatomy, but to Berwald’s once-moribund and now-reclaimed passion for marine biology, which compelled her to “grow a spine” to defend the ocean and its inhabitants. After obtaining a Ph.D. from the University of Southern California in ocean science, Berwald moved for her husband’s job and spent several years writing and editing textbooks in landlocked Austin, Texas. Her relationship with jellyfish in Spineless evolves from reading the findings of a “jellyfish” Google alert while her children are at school, to an obsession that draws her back to the ocean, both physically and metaphorically. By the end of the book, Berwald pitches and publishes an op-ed in The New York Times about her concern for the lack of marine risk assessment in a planned expansion of the Suez Canal. Berwald takes us from her first brush with marine biology in Israel to her present-day experiments and investigation, including raising jellyfish as pets in her Texas home. She becomes a trusted narrator and companion as she and the reader circle the globe to learn about jellyfish and the impact of humans on the ocean. By the end of her journey, Berwald has become a role model of how to follow one’s passion — or reignite an old one — and stand up for the environment. Despite these colorful descriptions, Spineless suffers from a lack of illustrations or photographs. Berwald writes about many types of jellyfish and related oceanic species with which the layperson is not immediately familiar, and I found myself frequently reaching for my computer to search for images of these creatures. My frustration with the lack of pictures came to a head when Berwald described the attempts of engineers to build a mimic of a jellyfish. Who would not want to see a photo, or at least a diagram, of an invention called the ‘Robojelly’? A second minor criticism is that the descriptions of jellyfish migration and classification were hard to follow. These sections would be improved with timelines, maps, and phylogenetic trees to better illustrate the geography of and relationships among these animals. I admire the ambitious scope of the book, but references and diagrams would have been helpful to keep years, places, and long Latin names straight. Just as “spineless” has a double meaning to Berwald, readers of Spineless will derive two pleasures from her account. The reader will learn a great deal about jellyfish themselves — how they move, navigate the world, and defend themselves from predators — as well as how research into jellyfish could lead us to insights about everything from “space sickness” to the nature of mortality. But the book is not solely an education on jellyfish and the marine environment. Spineless is also an inspiring tale of empowerment. Berwald’s journey demonstrates that we as a society and as individuals have the power either to harm the ocean or protect it. Will we take heed of the jellyfish’s message before it is too late? Emily North is a fourth year medical student at NYU applying for residency in internal medicine.